Coltsfolt was in full bloom in the sun yesterday, yet hardly noticeable the previous few cloudy days. The first I saw it blooming this year was on 15 April. Spring continues to bring out the posies. In the flower beds the crocus blooms are dying back and the anemones and hyacinths are taking their turns blooming. Tulips are still making leaves and starting to push up their flowers. Forsythia buds grew out last week to first blossom on 14 April. Red-spotted newts were seen floating around in the pond, too! Another plant showing the elevation effect on bloom time is a Star Magnolia on our ridge. It had half-opened three or four blossoms on 15 April, while another one down in the valley was in full bloom on the same day. Now that we’re almost a third of the way into Spring, the dandelions are out. This past weekend the first dandelion flower was picked. 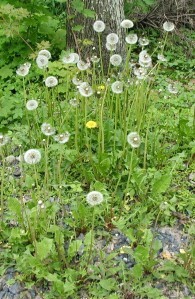 Once the dandelions show their happy faces, it’s notable for kicking off the lawn care season. Some people can’t stand to see the bright yellow flowers “messing up” their yards. We don’t mind them and prefer to leave things in more of a natural state. Grass is starting to get long enough to cut in some areas and the downed wood from winter and windy spring weather has to be picked up. Gardening activities can resume when the weather allows, but the early spring salads have already been enjoyed. Including dandelion! Ham and dandelion dinners are common around these parts in the week or two just before Easter. The idea is to pick the leaves before the blossoms emerge because then they are too bitter to enjoy. A fellow who was involved with making ham-n-dandelion dinner for 300 people admitted that his group buys the dandelion commercially. I’m sure there are a lot of country people and Amish that pick their own dandelion leaves. Dandelion salad is a leafy salad with a hot dressing. Hot bacon dressing gives a nice flavor and wilts the greens just enough to soften them a little…a real Spring time treat. 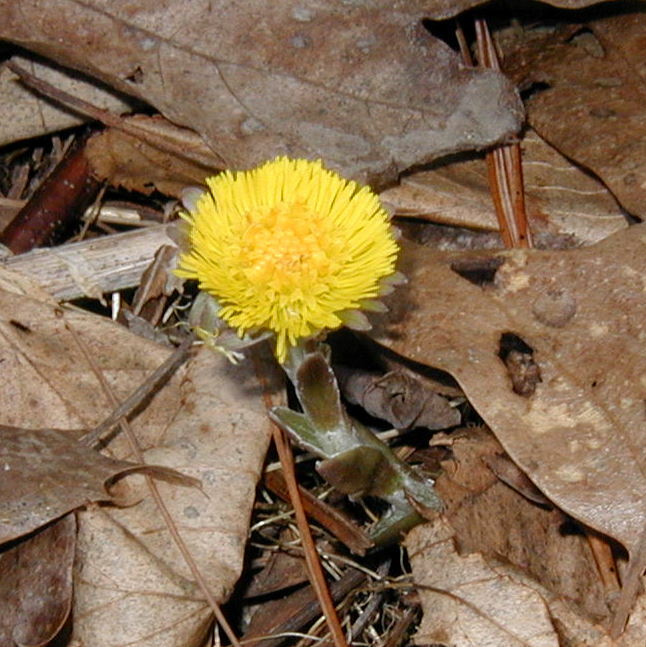 Blooming coltsfoot is another sign of Spring. 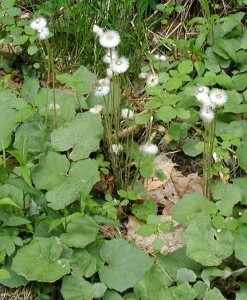 Coltsfoot only blooms in very early Spring in Pennsylvania, during the last week of March and the first week of April. I first saw them blooming on March 24th this year and expect them to continue blooming for another week. 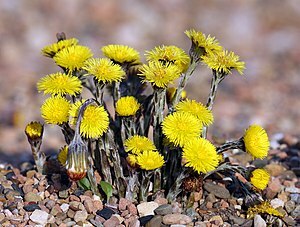 Coltsfoot, Tussilago farfara, can be mistaken for a dandelion, Taraxacum officinale, at first glance. Closer inspection shows the flower head is similar to dandelion, but the leaves of coltsfoot are quite distinct. Can’t show the leaves just yet as they haven’t emerged. That’s one big difference between coltsfoot and dandelion, dandelion leaves appear before the flower does. Another difference is that the dandelions aren’t blooming yet. So, near the end of March you’re likely to find dandelion leaves but no flowers, and coltsfoot flowers, but no leaves. Single coltsfoot flower on the forest floor near the lane. Coltsfoot flowers are composites of yellow, just like the dandelion, but the rays are thinner and more delicate-looking in the coltsfoot. Once the flower is pollinated, the resulting seeds are arranged in a fluffy ball, just like a dandelion, and its seeds are dispersed by the wind, too. 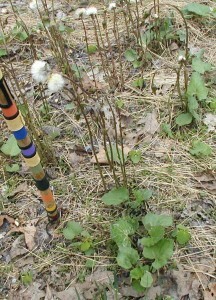 Coltsfoot flower stem with linear bracts of maroon color. Note the small bracts or scales along the flower stem. These inch-long bracts are held close to the flower stem and are maroon to brown. The true leaves are supposedly shaped like that of a young horse’s hoof, thus the name coltsfoot, but I don’t see the resemblance. 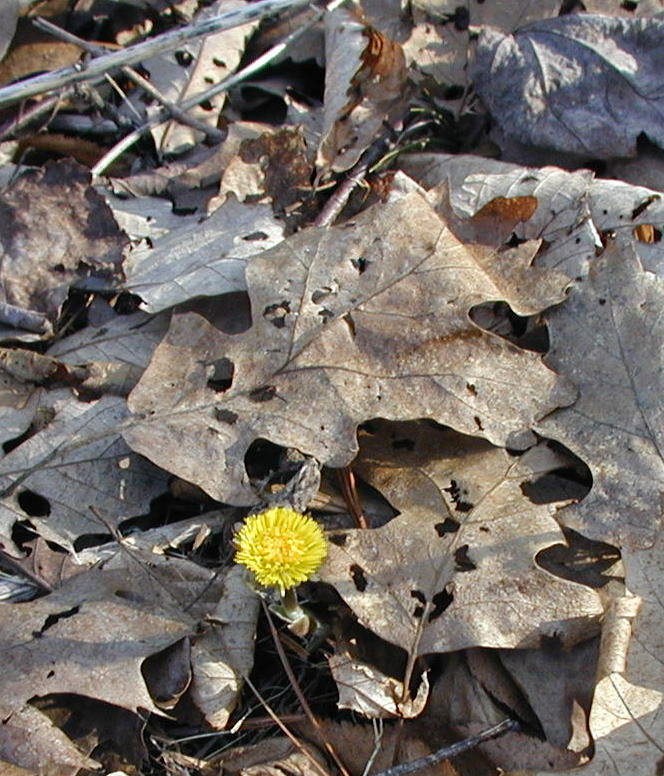 Leaves are heart-shaped at the base and emerge after the flowering is all but finished. Leaves continue to grow larger for a couple weeks more. The coltsfoot leaves will finish out the summer looking like little canopies all along the roadside where the flowers once bloomed.